The 160 acres of rolling woodlands are home to deer, foxes, reptiles, amphibians, and numerous species of birds. With so much to see and so many programs and activities to do, it is no wonder that so many people are rediscovering Rum Village. There’s a new dog park in town! The Rum Village Dog Park offers an area for small dogs, large dogs, community area available for rental, pavilion and more. Tucked away in the beautiful wooded Rum Village Park, you’ll feel like you aren’t even in the city. Rum Village is home to diverse wildlife. Over a hundred species of birds have been seen at Rum Village, including nesting owls, woodpeckers, and warblers. Foxes, deer, reptiles and amphibians can also be found in Rum Village. Nature-lovers, families, and students will enjoy exploring Rum Village Nature Center. Click here to see what the center has to offer. Come out to Rum Village for a game of disc golf! The view from the hills of Rum Village makes this 18 hole course a great place to play- and its FREE! Well-groomed park with a very old trees and elevation. Begins with birdie-able holes – the back 9 tests accuracy. There are now over five miles of trails at the Rum Village Annex, which is located on the west side of Gertrude Street, south of the entrance to Rum Village Park. There are beginner, intermediate and advanced trails to suit the skills of various riders. For information about the trails, check out the Northern Indiana Mountain Bike Association site. The 160 acres of natural woodland is a designated nature area. Three miles of trails wind through this habitat. Click here for a trail map. Please walk on marked trails – do not go “cross country”. Leave all wood (living or dead) to rebuild natural humus. Pets are welcome on our trails, however, please keep all pets on a leash. This treetop adventure trail ranges 16-60 feet in the air. Participants choose their own self-guided course an engage in a combination of obstacles and zip lines. To see more information click here. Edge Adventures aerial parks are treetop trails ranging from 16-60 feet in the air. Participants choose their own self guided course and engage in a combination of obstacles and zip lines as they maneuver their way through different trails with a progressive degree of challenges. The city’s second dog park is located at Rum Village. Planning and community meetings for the new location started in the spring of 2017. The new dog park features both a separated large and small dog areas as well as a separated socialization area. The park will also feature a deck, walking path, rest room, and amenities for both people and their dogs. The 18-hole disc golf course at Rum Village will be realigned and many holes improved. Play will be studied for ways to improve the service. Ewing Ave. at Gertrude St.
One open-air, covered pavilion is available for rent. Each holds about 75 people, and offers electricity. The dog park sits within Rum Village Park which boasts beautiful scenery, an 18-hole disc golf course, playground, walking trails and a nature center. A rough map of the park is available here. Two open-air, covered pavilions are available for rent. Each holds about 64 people, and offer electricity and grills. The beautiful, rustic park offers an 18-hole disc golf course, a 10,000 sq. ft. playground, acres of walking trails and a nature center. 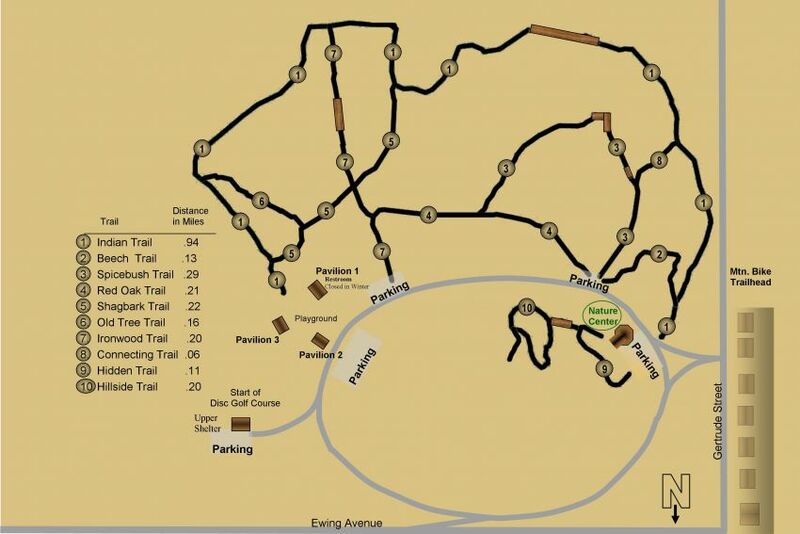 A rough map of the park is available here.